Christmas is typically, and rightfully, thought of as a season of joy, but it can be a painful season for many people. Maybe you’re one of them. What battles do you face today? What pain is relentlessly bombarding you as you hunker down in the trenches of life? What darkness haunts you even under the twinkling lights, candles, and decorations? We may not be able to end the personal, emotional, cultural, or physical wars we are fighting this holiday season, but even in those darkest places, we can lean into the God who is with us. 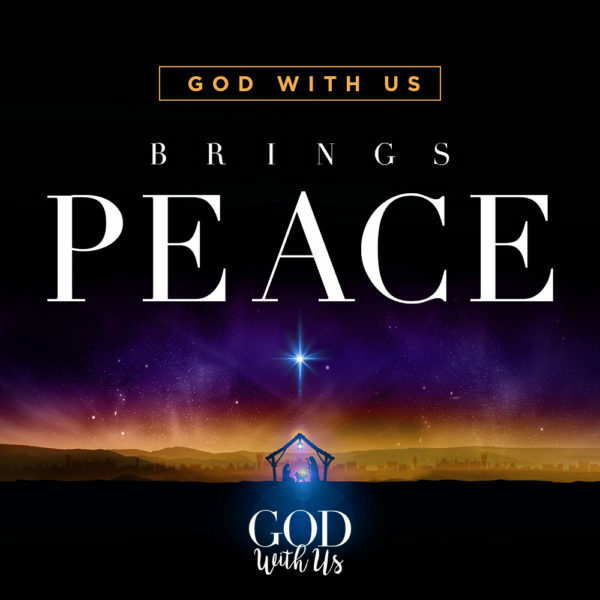 Today as we continue our Advent journey toward Christmas, we are focusing on and celebrating peace, the peace that has been brought into our word by Emmanuel, God with Us. My hope is that each of us will experience the comfort of Christ’s peace deep within our souls. As we talk to Him and give Him thanks, God’s peace swells within us and guards our emotions. This is a miraculous peace, one that transcends all understanding. It doesn’t make sense given the worry and fear we are facing. It wouldn’t naturally exist in the midst of our struggles. But this is God we are dealing with! This is our Prince of Peace, the giver of shalom, the giver of His Spirit of peace. When we come close to Him—when we go to worship Him like those shepherds did—we connect with Him, and He transforms us and our outlook. No matter how bad the storm swirling around and within us, He can calm it. And He can carry us through it.